Tyyni Tuulio (née Haapanen, Tallgren 1917–33) was the daughter of the vicar of Karvia, Jaakko Haapanen. Like her siblings, her interest in music and reading was sparked by her upbringing at home. Tyyni played the piano, but professionally she oriented towards literature. Tyyni’s brother Toivo Haapanen became an acclaimed conductor and musical scholar. 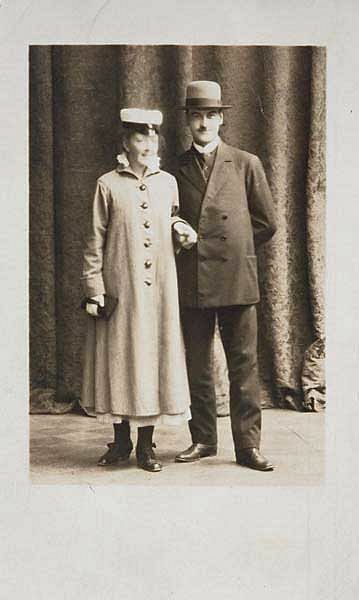 After the death of her father in 1905, the family moved to Helsinki, where the family’s gifted children were better able to exploit the opportunities for study. Tuulio, who studied Romance languages and literature, completed her bachelor’s degree in 1916 and gained a master’s degree in 1927. While studying, she also engaged in translation work, translating into Finnish the novels of Charlotte Brontë and L. M. Alcott’s books for girls. Her breakthrough as a translator came, however, with her Finnish translation of Dante’s La Vita Nova in 1920. At university Tuulio met Oiva Tallgren, docent in Southern Romance Languages, and they wed in 1917. In 1928 Tallgren became professor extraordinary of Southern Romance languages at the University of Helsinki. The couple, in thrall to language and literature, changed their surname to Tuulio in 1933. Three sons were born to the family, and the many responsibilities of a mother prompted Tyyni Tuulio to ponder her role as a woman and mother. Under the pseudonym Tuulia, she wrote the works Paljain käsin: erään äidin päiväkirja (‘with bare hands: the diary of a mother’, 1933) and Sininen ikkuna: kymmenen lukua erästä ihmiselämää (‘The blue window: 10 chapters of a person’s life’, 1936). Tuulio decided to divide her time between her husband, children and her vocation as a writer. Tyyni and Oiva Tuulio’s engagement photograph. Photo: SKS, Kirjallisuusarkisto. For six decades Tuulio’s pen worked diligently, and she published high literature, biographies and causeries. As a translator, Tuulio translated literature of all persuasions from the Romance languages and Swedish. In addition she produced research literature from material she and her husband had collected on research trips to Europe. Before the advent of television, ‘armchair travel’ through the medium of books was extremely popular in Finland. Tyyni Tuulio was able to accompany her husband, the professor, on his research trips abroad, and her experiences formed the basis of such works as Me lähdemme Ranskaan ja Espanjaan (‘We’re going to France and Spain’, 1927) and Kaupunki vuorella: matkakirjeitä Italiasta (‘The city on the mountain: letters from Italy’, 1931), both of which she wrote under a penname. The 1930s was also the golden age of spirited causeries written by women. Through her columns, the perky-tongued Tuulio was able to describe the literary and cultural circles she encountered and also offer glimpses of her family life. Although in her literary production Tuulio highlighted the problems of her role as a woman and mother, the novel of her friend Helvi Hämäläinen, Säädyllinen murhenäytelmä (‘A respectable tragedy’, 1941), with its accompanying revelations, came as a shock. A work of fiction, readers were nevertheless able to interpret it as a near documentary depiction of the leading cultural figures of the day, including Tyyni and Oiva Tuulio. In the same year that Säädyllinen murhenäytelmä was released, Tyyni was to experience two tragedies. Her husband contracted tuberculosis and died in June 1941, and some months later, more ill-tidings reached her door: her eldest son had fallen on the Kurhumäki front on November 8, 1941. Tuulio rallied her strength and moved from Helsinki to Järvenpää, where she was able to regain her literary and scholarly creativity. It is claimed that Tuulio deferred her own aspirations to write a doctoral dissertation on several occasions due to the huge number of pieces she was commissioned to write. The University acknowledged Tyyni Tuulio’s scholarly merit by granting her an honorary PhD in 1960. 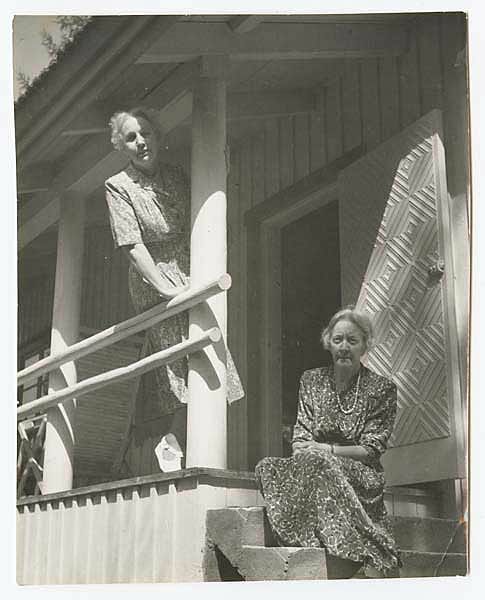 Editor-in Chief Alli Viherheimo and Tyyni Tuulio, 1953. Photo: SKS, Kirjallisuusarkisto. In addition to writing, Tuulio’s passion was working in cultural organisations. She was active at the Finnish Women’s Alliance, the Finnish PEN Club and the National Literature Committee. In addition she guided young students towards literature with the help of literature circles. In her final works Tuulio concentrated on depicting influential Finnish women who had, in her opinion, unjustly fallen into obscurity. In answer to Rafael Koskimies’s Runebergin Suomi (‘The Finland of Runeberg’, 1977), Tuulio published Fredrikan Suomi (‘The Finland of Fredrika’, 1979). 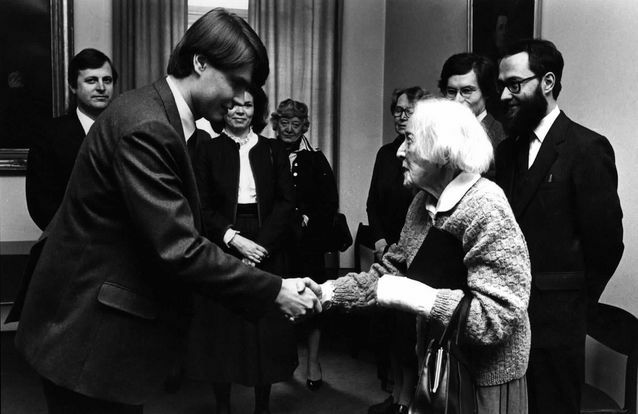 Her last published work was the Finnish translation of the collected works of Fredrika Runeberg, Piirroksia ja unelmia (‘Drawings and dreams’, 1982).This translation and her high-quality translation work over more than 50 years were acknowledged with the award of the State translation prize in 1985. Tuulio was then 92 years old. The publication of the doctor of philosophy h.c. Tyyni Tuulio's book of the history of Spanish literature in 1983. The book has been written already in the 1930s, but the war hindered its publication. In the photo Jaakko Rytilä from Gaudeamus Oy is shaking hands with Tyyni Tuulio, professor Timo Riiho on the right. Photo: Kuvalaitos / Helsingin yliopistomuseo. Sala, Kaarina (2007): Tuulio, Tyyni (1892–1991). National Biography web publication. Helsinki: Finnish Literature Society. Accessed 16 September, 2015. Available for free on the Nelli portal. Tyyni Tuulio, Wikipedia. Accessed 16 Spetember, 2015. Koskinen, Irma (ed. ), Tyyni Tuulio – Nuoruusajan kirjeenvaihtoa. Finnish Literature Society, 2008.